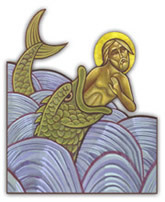 Saint Mina Holmdel, NJ - Jonah - "The Lord, his God"
The Lord chose Jonah the Prophet despite his faults and used his weaknesses to make him stronger. The Lord worked through him, in him, and with him to give him guidance and to teach him. Mentally and spiritually Jonah benefited from many lessons within his Old Testament Book. Let us more closely examine why perhaps the Lord loved Jonah. "Now the Word of the Lord came to Jonah, saying 'Arise, go to Nineveh, that great city, and cry out against it; for their wickedness has come up before Me.' Upon hearing this, Jonah arose to flee to Tarshish from the presence of the Lord. He went down to Joppa, and found a ship going to Tarshish; so he paid the fare, and went down into it, to go with them to Tarshish from the presence of the Lord" (Jonah 1:1-2). As you know, Jonah attempted to flee from the presence of the Lord. On route to Tarshish a mighty and powerful wind came upon the sea. So strong was this wind that the ship was threatening to break into pieces and sink. Jonah and his troubles were discovered to be the cause of the tribulations upon the mariners of the ship. After much contemplation, prayer, and the casting of lots, Jonah was finally thrown overboard into the raging sea. Here God's care for Jonah becomes very evident. Events do not happen without Divine Providence. God sent the great winds and strong gales to show His displeasure with Jonah's disobedience. Even so, the Lord also sent Jonah a place of safekeeping in his oppression. Jonah could have met death as he was tossed over the ship. But the Lord in His Goodness chose to protect Jonah. Why did God love Jonah? Perhaps the answer lies within the belly of the great fish that swallowed Jonah. God sent a fish beside the boat to swallow Jonah. Jonah inside this fish's belly was most probably in darkness with the exception of when the fish surfaced for oxygen. He was most probably tossed about constantly with the diving and swimming motions of the fish. Further, one can imagine the salty water ever present and immersing most of his human body. As Jonah underwent all of these perils within the fish we are not told of anything negative he said against the Lord. I am quite sure Jonah realized the God of the sea received him and protected him. The fish was Jonah's shelter and not a punishment. It would take a very wise man to rationalize this message under these dire circumstances. He was given a place of safekeeping not death. For three days and three nights he remained in the belly of the whale. Inside the whale, Jonah the Prophet blessed the Lord. He called upon the Lord in his affliction. Jonah did not demonstrate fear nor are we told he appeared troubled. There is no documentation that he grieved his circumstances. Jonah in his wisdom knew the Lord created this great fish that consumed him. He knew the great fish's life and direction were both guided by the Lord. Perhaps God loved Jonah for his trust in the Unseen. Within the belly of the whale, Jonah returned to his senses. He knelt down and prayed to God. He beheld the Lord "his" God and rejoiced in His presence. He returned once again to his prophetic rites. He returned to an obedient God-loving man, believing in His Holy promises. Jonah offered thanksgiving. Perhaps this nature of Jonah during hardship was what made God love him so. Previously Jonah called the Lord, "God of Heaven," but in oppression, "The Lord HIS God." Jonah realized the Lord was the Savior of the oppressed and the sufferers. Just as Jonah came upon this realization we should too. Jonah is a symbol of our weaknesses, which can also help to make us stronger. The waves did not suffocate Jonah. The whale caught him up and he did not perish. After three days and three nights, the Lord commanded the fish to "vomit Jonah onto dry land" (Jonah 2:10). His salvation came from the Lord. As the billows and waves of life also encompass us, let us follow Jonah's example and trust in the Lord. Remember Jonah's whale and be assured of our God's long suffering. Be careful in your complaints. Jonah's example of blessing your circumstances and having faith preserved his life. The great fish can come in many disguises in the contemporary world of today. As Christians we need to take on this spirit of wondrous faith and assurance of the Unseen. Jonah was given another chance. I believe our God is long-suffering. He does not hastily abandon or become angry with those servants who fall by the wayside. Let us pray that we will all learn many lessons from Jonah's example inside the belly of the whale. Let us draw closer to the Lord "his" God realizing through his Biblical example that this also makes Him the Lord "our" God.